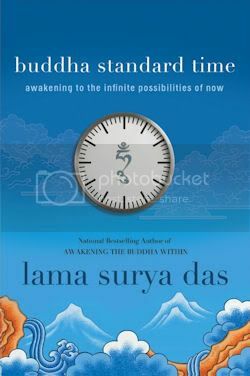 Buddha Standard Time by Lama Surya Das is the book to read if you are so busy that you think you don’t have time to do things. Read this book and start to de-stress by getting back in tune with the natural time of things – not a clock. “We're all given the same twenty-four hours a day. We can spend our time feeling hurried and harried, overwhelmed by chores and demands, distracted and burned out . . . or we can awaken to Buddha Standard Time, the realm of timelessness where every choice, every action, and every breath can be one of renewal and infinite possibilities. Buddha Standard Time shares one of the great realizations of Buddhism, an insight that anyone can learn to apply. The minutes and hours of our days do not simply march from future to present to past. Rather, each moment is intersected by a fourth dimension. By learning to live in this dimension—Buddha Standard Time—we reduce the amount of stress in our lives and find greater focus, fulfillment, creativity, and even wisdom. Drawing on Tibetan Buddhism and other great wisdom traditions, as well as on neuroscience and holistic traditions, renowned teacher and national bestselling author Lama Surya Das shares real world examples, practical exercises, and essential techniques. Buddha Standard Time is a book that everyone who thinks they are so busy they have no time to even stop and enjoy a sunrise or sunset should read. It includes guides to help readers start living in the present moment and to enjoy things that they really want to do. It doesn’t promise to expand your 24 hour day into 48 hours, but if you start practicing some of the steps and meditations, you may just find yourself with extra time in the day so you can start enjoying your “time” once again. Overall, I found that the exercises are quite helpful in learning how to meditate and reconnect with nature. I highly recommend this book to everyone who needs help de-stressing and enjoying the time in a day again. * Thank you to the publisher of Buddha Standard Time, Harper One, for providing me with a copy of this book for review. All opinions expressed are my own.